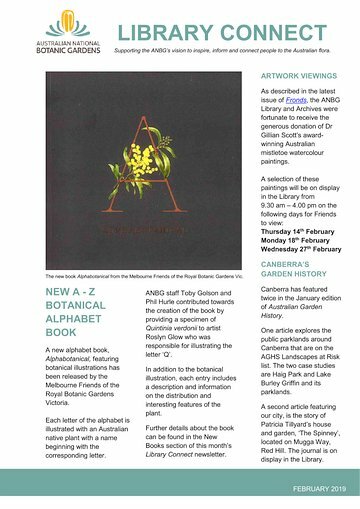 A new A-Z alphabet book, Alphabotanical, featuring botanical illustrations of Australian native plants whose names begin with the corresponding letters. It was written and illustrated by Joan Mason, Pam McDiarmid & Ashley Tardy; and released by the Melbourne Friends of the Royal Botanic Gardens Victoria. Dr Gillian Scott’s award-winning Australian mistletoe watercolour paintings will be displayed in the Library for Friends to view from 9:30am to 4:00pm on Thursday 14th February, Monday 18th February, and Wednesday 27th February. From the ANBG archive: Index Seminum, 1965.